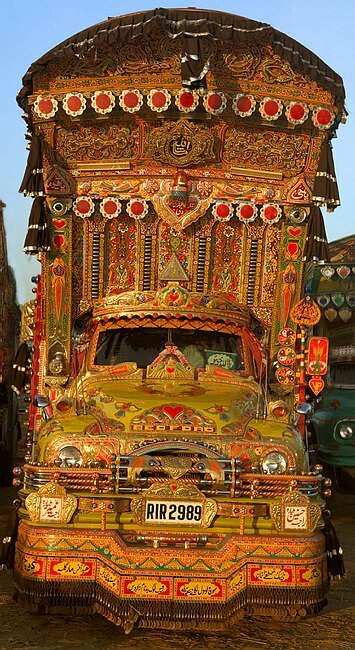 I’ve ridden in some Pakistan buses decorated like this truck, and I do believe the extreme color makes the dusty, long trip more fun. I took a few photos, but nothing like the wonderful portfolio of art that Peter Grant has accumulated. He’s followed the trucks back to their painterly sources. 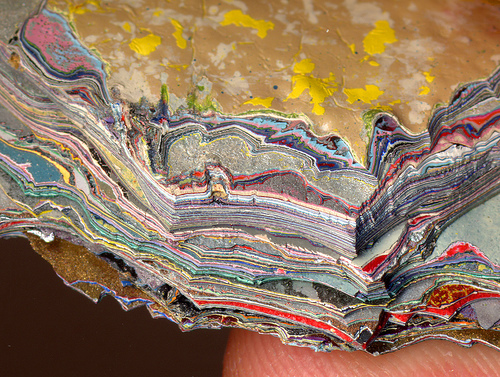 And it is not just trucks (or lorries as they are called there) that succumb to these paint jobs, and that Grant captures. 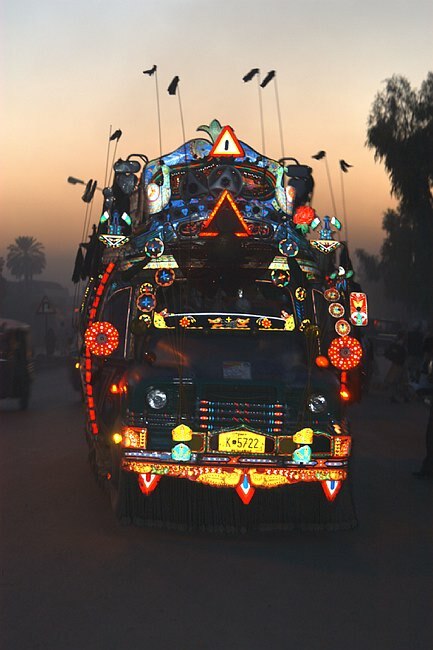 Pakistanis paint bikes, carts, jeeps, scooters, buses and boats in a similar riot of color. Some may wonder, why? These large, ornate decorations remind me of the massive antlers of moose. According to some evolutionary biologists, the fantastical, and impractical horns are the result of a runaway arms-race, as males try to outdo other males in their maleness. I think the same is happening with the lorry decorations in Pakistan. When I was there 30 years ago, the art was simpler (although still eye-popping). It has gone over the top as artists and owners try to outdo each other in detail, scope, and intensity. This art is cool and useless, and hugely impractical. For a related exaggerated decoration of trucks, see the Japanese Dekorata in Street Use.